ars ludi » Microscope Seeds: Who Watches the Watchmen? 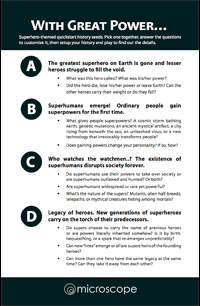 In honor of Emerald City Comic Con I whipped up some Microscope quickstart history seeds with a superhero theme. Quick seeds are ideal for cons or any time you need to sit down and get playing in a hurry. Now put on your cape and go punch history in the face. Awesome Hans. Let me know how it went. I’ve had a lot of luck getting strangers playing quickly with seeds. Just wanted to let you know that I’m running MS at a meetup today and am going to use the Superhero seeds! Looking forward to it, and will probably end up sketching out some seeds of my own. @Jamie: No superhero legacy game could compare to ours, but I didn’t want to intimidate anyone. I remember playing D before it was a Thing on the Internet – I think it was my best session of microscope yet. @ Ashley: Way ahead of you. Well may not way ahead, but a day or two at least. I know exactly what you mean Hans. That blank “what history should we make” can be intimidating. There’s also a bit of an optical illusion because the history never has to be interesting at the start (you play to discover the interesting bits) but it’s human nature to want to be excited about the starting point or to see it as already unique. I also think having a huge list of seeds (like in the back of the book) doesn’t help either. A nice short list, along with some prompts to flesh it out, is the way to go. Awesome. I feel like I often don’t play Microscope because of all the work required to come up with a compelling history at the beginning. I’d love to see a lot more of these things!